A woman published a book and met a web marketer at a networking event. The marketer voiced his excitement for her book and offered to produce a website for her for free if she would agree to a monthly retainer for video creation and marketing. There was only one problem. The marketer registered the author’s name as a .com and he registered it in his own name as the owner. The author is now bound by the web marketer’s services. If she fails to pay his monthly retainer rate, or decides to change services providers and make a new website under her name and domain name, she will have to fight to gain ownership of that domain name. You might think this is a story brought out of the closet from the early 2000’s. But, it happened just this past summer in 2018. And, it happens more often than you or I want to believe. Fortunately, as of this writing, the client is happy with the service provider. But, you know how people go out of business, change directions, or even die. The client will simply be out of luck when she attempts to get control of her domain name. If your website is the heart of everything you do on the web, then your domain name is the brain. It’s that important. The domain name is what tells all the Internet service providers and web servers where your website files reside. 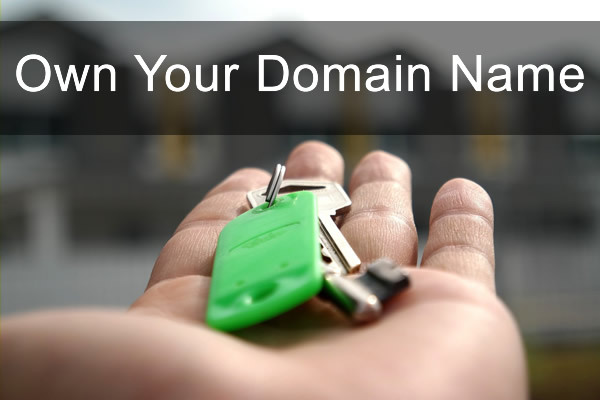 Your domain name is like the street address of your home. For something that important, why would you allow someone else to register your domain name? The unfortunate reality is that business owners allow employees, 3rd party service providers, friends, spouses, siblings, cousins, and volunteers to register domain names for their superiors every day. Don’t you be one of them! If reasons for complete and full domain name ownership are not yet clear, here are some additional drawbacks to not having control of your domain name. Stuck with Hosting – You cannot move your website to a new hosting company unless you can change where your domain name is pointing. If you do not have access to your domain name to make those changes, you will not be able to change website hosts. Lack of Renewal Control – With some domain name registrars, you may be able to renew your domain name year after year even if you do not have access to the account as the administrator of the domain name. But, you would still not be able to make administrative changes to the domain name account itself. Expect Overcharging – When someone like a web designer or virtual assistant has control of your domain name, expect to be paying up to 20 times the amount you should be paying for use of that domain name. The service provider will typically build in your domain name usage into a package deal that involves website hosting, SEO, and content management. Loss of Longevity – Google considers the length of time your domain name has been active in association with a website as one of the 200+ factors Google considers when placing your website in SERPs (Search Engine Results Positions). If you have had a domain name owned by a service provider for the last five years, for example, and decide to give up on getting ownership of that domain name by registering a new domain name, you will forfeit that longevity you’ve built over the years of the domain name being active. If you have allowed a helper to register your domain name, start making the attempt NOW to get your domain transferred to BestDomainPlace.com so that you can truly own your domain name. Domain name transfers are free! You only pay for at least one more year for the domain name and the transfer is included with your purchase. Domain Name Expiration – Probably the most devastating results of not owning your own domain name is when your domain name is lost forever because it is not properly renewed within a timely manner. Domain names are typically setup for auto-renewal when the renewal date approaches. Web designers and Internet services providers who manage domain names often manage hundreds, if not thousands, of domain names. If their credit card gets maxed out or they simply forget to pay, your domain name, website, and even your business are potentially at risk. Death Causes Problems – One of my clients is a non-profit organization. Their original web designer died five years after the website was launched. We spent three months rescuing the domain name by ultimately convincing the domain name registrar that the designer was actually alive and was granting release of the domain name that was registered in her name! We originally used an honest approach by telling the support department at the registrar that the designer had died and the organization was attempting to gain control of the domain name. But, they wouldn’t have it! Eventually, we found a cover letter with a work proposal from the original design of the website and used the logo to create a letter and fake signature by the deceased to the registrar to gain access to the domain name. The main reason we started Best Domain Place was to provide a second level of support for our clients’ domain names. Most people are not skilled in the many ways domain names can be lost from rightful ownership. Even if you register your domain name on your own through a standard registrar, you are on your own if something goes wrong. It’s just you and the registrar support department. Even if you do not currently have an emergency with your domain name ownership, now is the time to transfer all of your domain names to BestDomainPlace.com. When you do, we will provide you with a special checklist to protect your domain name from being hijacked, stolen, or lost. You won’t find this checklist on any blog post or hear it in any seminar because it is exclusive to this domain name registrar.